Ford Motor Company is investing in the future as it begins installing LED lighting at manufacturing facilities across the globe. The new lights, valued at more than $25 million, will save energy and money while improving safety and lighting quality. The 25,000 new LED fixtures will replace traditional high-intensity discharge and fluorescent lights, and are expected to reduce Ford’s energy use at manufacturing facilities by 56 million kilowatt-hours annually – enough to power more than 6,000 average-sized homes per year. That equates to an up to 70 percent reduction in lighting energy consumption compared to traditional technologies. Annual energy costs are expected to be reduced by approximately $7 million. 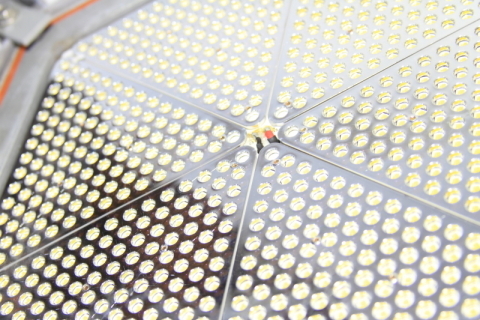 The need for maintenance will diminish, as LED lighting has a 15-year life expectancy. Studies show LED light output remains steady at less than 1 percent degradation per year over the life of the equipment, while fluorescent and HID fixtures require re-lamping in as little as two years. LED lights improve safety by eliminating hazardous materials in fixtures and lowering fire risks. At the same time, the technology provides a brighter work area, better uniformity and improved color perception, resulting in a better quality of light for plant employees. In 2011, Ford embarked on an aggressive program to lower its energy use 25 percent per vehicle produced at its facilities by 2016. The company is well on its way toward meeting that goal, having achieved a 20 percent energy efficiency already, explained George Andraos, director of energy and sustainability at Ford Land. The switch to LED lighting helps to ensure Ford will meet its target. Work began at Dearborn Truck Plant late last month to replace worn and outdated overhead lighting. The LED replacement program will continue through the year at 17 other Ford manufacturing facilities across the globe, including Kentucky Truck Plant in Louisville, Kentucky; Livonia Transmission Plant in Livonia, Michigan; Dearborn Stamping Plant; Essex Engine in Windsor, Ontario; Dagenham Engine Plant in Dagenham, England; and Oakville Assembly in Oakville, Ontario. Recently, Ford also announced that it will work with DTE Energy to install Michigan’s largest solar carport at its Dearborn world headquarters. When completed in early 2015, the project is expected to generate 1.3 million kilowatt-hours annually, enough energy to power 159 average-sized homes for a year. Ford Motor Company, a global automotive industry leader based in Dearborn, Mich., manufactures or distributes automobiles across six continents. With about 186,000 employees and 65 plants worldwide, the company’s automotive brands include Ford and Lincoln. The company provides financial services through Ford Motor Credit Company. For more information regarding Ford and its products worldwide, please visit http://corporate.ford.com. Ford Land is a wholly-owned subsidiary of Ford Motor Company and a full-service provider of real estate, construction and facility services. Formed in 1970 to develop 2,360 acres of land surrounding Ford’s world headquarters in Dearborn, Michigan, Ford Land master-planned and developed the Fairlane community. Fairlane is characterized by its preservation of the environment, award-winning architecture and full complement of dining, retail, hospitality and recreational amenities. One of the largest commercial landlords in southeast Michigan, Ford Land owns more than five million square feet of commercial office space in Dearborn and Allen Park, Michigan.